“The Wonder Fears” probably won’t cause too many nightmares, but it is a well crafted and very entertaining tale. The story is narrated by a man named Dino who recalls how much he used to love Halloween until he was ten-years-old. That year everything changed. Dino is twenty-four now and he still has nightmares about what happened that night. As the name suggests, “The Wonder Fears” is very reminiscent of the TV series The Wonder Years. The story is narrated by Dino Manzella, who also wrote the tale; and Manzella should be congratulated for coming up with such an entertaining story, narrating it so well, and even managing to sound a lot like Kevin Arnold from The Wonder Years. Manzella hasn’t done it all by himself though. This is a well produced audio drama. The music and sound effects (howling, ticking clocks, insects chirping) all help to create the right atmosphere and bring the tale to life, and it has to be said that Trevor Paulson and Nate Nillson were excellent choices to provide the voices of young Dino and Mark. They work well together, all of the dialogue comes across as very natural, and when Mark tells the zombie, “Come get some you Monkey!” I couldn’t keep a straight face. This story is a lot of fun and I have no qualms about recommending it to listeners of all ages. 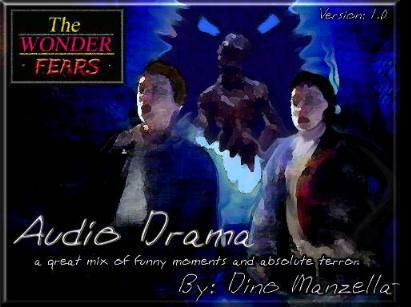 “The Wonder Fears” audio drama works very well as a stand alone piece, but it is; in actual fact, only the first half of the story and Manzella has made it available as a free download because he is keen to bring his work to attention of film producers. As far as I know this has not happened yet, but I, for one, would love to watch a film version of the story, so my fingers are well and truly crossed. “The Wonder Fears” has a runtime of about 40 minutes and is available as a free download from a few audio book websites and also from the authors own website, where you can also find out a little more about the project.